Jason Raymond Bay was born September 20, 1978 in Trail, British Columbia Canada. At 12 years old he went to the Little League World Series with his Trail team. Eventually he was drafted while attending Gonzaga University in Spokane, Washington, by the Montreal Expos in the 22nd round of the 2000 MLB draft. In Spring Training of 2002 he was traded to the New York Mets for Lou Collier. The Mets soon traded him along with Bobby Jones, to the San Diego Padres in July 2002 for relief pitchers Jason Middlebrook & Steve Reed. The next season he made his MLB debut in a Padres uniform and hit a HR in his first game that May. On May 25th he was hit by a pitch & broke his wrist, finishing his promising rookie season. In August of that same year the Padres sent him along with pitcher Oliver Perez to the Pittsburgh Pirates for Brian Giles. In 2004 Bay became the first Canadian born player to win the Rookie of the Year Award, hitting 26 HRs 24 doubles 82 RBIs a .358 on base % & a .282 batting average. That season he broke Ralph Kiner’s half century old Pirates rookie HR record of 23. In the small market of Pittsburgh, Bay became a local hero & a two time All Star. In 2005 he hit .306 (10th in the league) with 32 HRs, 102 RBIs, 110 runs scored (4th in the league) a .402 on base % (9th in the NL) & 95 walks (7th in the NL) while playing in all 162 games. He is considered a slow base runner, but was highly successful when he did attempt to steal a base. 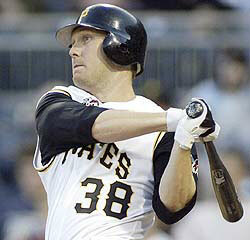 In 2005 he tied an MLB record of 21 straight stolen bases without getting caught, a personal career stolen base high. That season he led all NL left fielders in fielding % (.996%). In 2006 he had a great May winning the Player of the month Award hitting 22 HRs, including a stretch of six straight games with a HR. The city of Pittsburgh campaigned heavily for Bay to get voted into the 2006 All Star game which was to be played at PNC Park in Pittsburgh. The cause was pushed a step further, when Pearl Jam was in town for a concert. Lead singer Eddie Vedder told the fans to go out & vote for Jason Bay. He ended up leading all outfielders in the voting and started in right field in the Mid Summers Classic going 1-3. The hometown crowd gave him a huge standing ovation during the pre game introductions. His 2006 numbers were similar to the previous year 35 HRs 29 doubles 109 RBIs 102 walks (6th in the NL) a .396 on base % (79h in the NL) but his average was lower (.286). In the outfield he made ten assists posting a .991 fielding %. He battled injuries in 2007 and had his worst year only batting .247 with 21 HRs & 84 RBIs. That year he made 13 outfield assists which was third best in the league. 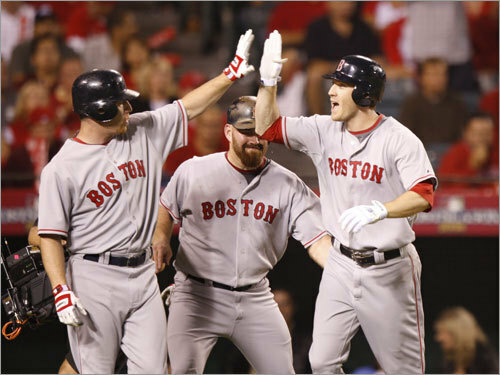 In 2008 he was part of a huge three team deal that sent him to the Boston Red Sox & Manny Ramirez to the Los Angeles Dodgers. He had another fine year with 31 HRs 35 doubles 101 RBIs while batting a strong .286. He played in his first post season and had a great ALDS hitting a HR in the each of his first two games. Overall he batted .412 with 5 RBIs in the series against the Los Angeles Angels. In the ALCS he hit .292 (7-24) with another HR & four RBIs while losing to the Tampa Rays. In 2009 he had a good time bashing balls toward the green monster at Fenway Park; he came in third overall in the AL in HRs (36) second in RBIs (119) third in walks (94) & sixth in runs scored with 103. He had 29 doubles with 94 walks, played in another All Star game & was seventh in the AL MVP voting. Although his batting average dropped to .267 & he struck out 162 times. Bay strikes out often enough to be among the league leaders in that category & has struck out over 125 tomes five different seasons. 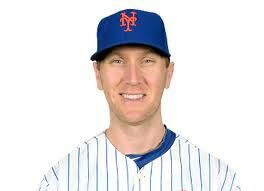 For the 2010 season Bay signed a four year $66 million deal with the New York Mets. On Opening Day 2010 he had two hits & began the year hitting safely in nine of ten games. 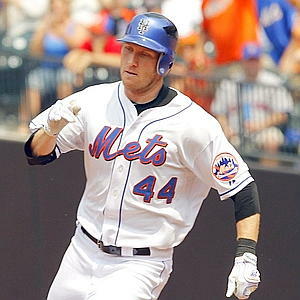 He hit his first HR against the Los Angeles Dodgers at Citi Field in the first game of a double header on April 27th in a 4-0 Mets win. In the last week of April he went on a ten game hit streak and drove in runs in five of six game. In mid May he went on an eleven game hit streak and drove in two runs in back to back games against the San Francisco Giants. 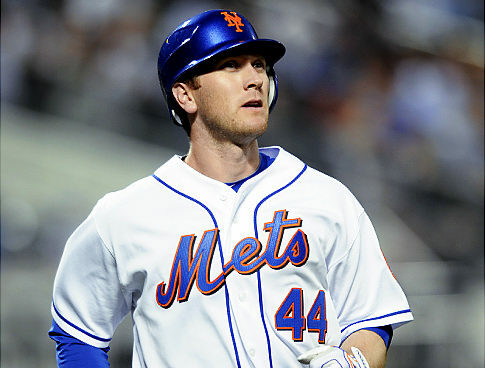 In the May subway series matchup at Citi Field, Bay had a four hit day against Phil Hughes & Chan Ho Park on the Sunday evening game. 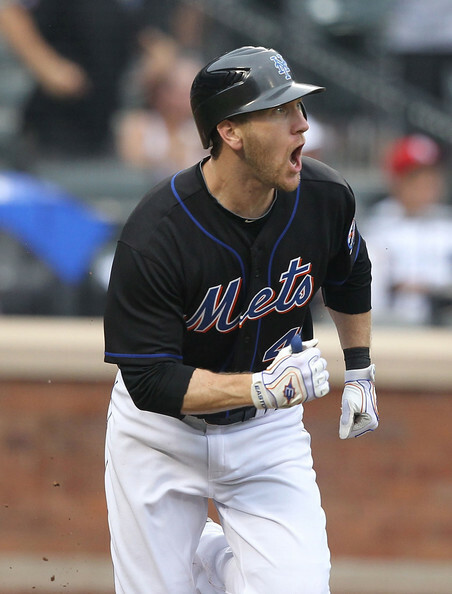 He came back the next day hitting two HRs & driving in four runs leading the Mets past the A.L. New York club. Bay peaked at the .300 mark but slowly fell off from there. He hit three more HRs in June but overall wasn't showing any power. He was hanging in there but the big hits like in his past weren't coming, as everyone in New York was waiting for him to adjust. On June 28th he hit two HRs in Florida & drove in all three runs in the Mets 10-3 loss to the Marlins. On the fourth of July at Washington in a game against the Nationals he had his first Mets four RBI day which included a 1st inning two run triple. , In that game he did strike out three times as well. In July he suffered a concussion while running into the outfield wall in a game against the Los Angeles Dodgers. The injuries got the best of him, shutting him down for the rest of the season. His first season in New York, was a very disappointing one. Bay played in just 95 games batted .259 with 6 HRs 20 doubles & 47 RBIs posting a .347 on base %. In leftfield he posted a .993 fielding% & made six assists. In 2011 there was more expectations for Bay but again he has struggled. 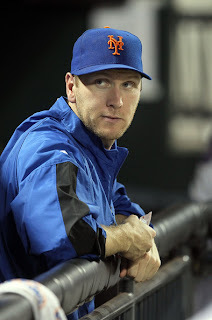 At the end of Spring Training he suffered a rib injury which kept him out until April 21st missing the first 18 games. On April 23rd he hit his first HR of the season, he drove in three runs in the Mets 6-4 win at Citi Field over the Arizona Diamondbacks. It took him three weeks to hit another HR & then it took another month for him to hit his third HR. On June 28th in Detroit the Mets had one of their biggest offensive inning outbursts, putting up seven runs in the top of the 4th inning. That inning Bay hit a grand slam HR off the Tigers Daniel Schlereth, breaking a Mets drought of 299 games without a grand slam. In the next inning Carlos Beltran added his own Grand Slam leading to a 14-3 Mets win. 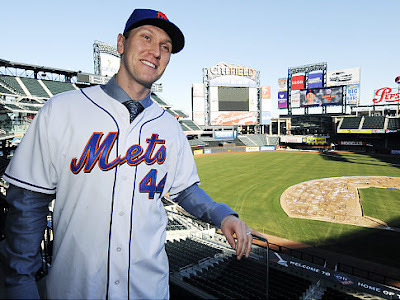 On July 3rd he had his first Mets walk off hit, it came during an interleague Subway Series game at Citi Field as he singled home Scott Hariston in the 10th inning. On July 5th Bay hit two HRs in Los Angeles in a game against the Dodgers, but it was the only two he hit all month. At the All Star break he had just six HRs & was batting .237. His August was a bit better as he hit three HRs that month, including his 200th career HR on August 8th. It came off the Padres Tim Stuffer & made Bay the third Canadian MLB player to hit 200 HRs. In what is not a big month at all, he drove in six runs raising his average ten points to .248 by mid August. On September 8th Bay hit a grand slam off the Atlanta Braves Matt Minor, but the Mets still lost 6-5. Bay finished off another disappointing year batting .245 with 12 HRs 19 doubles 57 RBIs & a .329 on base %. In 2012 his terrible run in New York continued. Although his April was highlighted by hitting two HRs he finished the month batting .240. Then after making a diving catch on April 23rd he went on the DL for eight weeks with a broken rib. 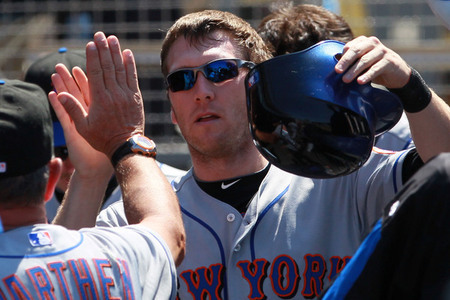 He returned in June for one week which was highlighted by a HR in Tampa that helped Johan Santana to a 9-6 win. But Bay once again went down with injuries & missed another month of action. At the All Star break the Mets were in second place having a surprisingly good year, but as soon as Bay returned it all fell apart. The team lost 12 of 13 and Bay was hitting just .150 by mid August. By that time manager Terry Collins announced he would be a part time player in left field. He finished the year batting .165 with 8 HRs 20 RBIs & a .237 on base % in 70 games. 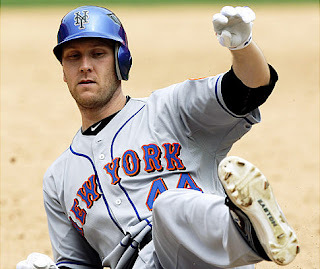 Bay was released in November 2012 ending his three year run with the Mets in which he batted .234 with 26 HRs 124 RBIs in 288 games. 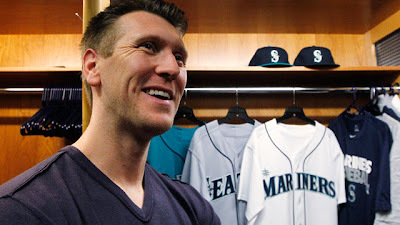 He was signed by the Seattle Mariners for 2013 & after68 games was hitting .204 & was released. In his 11 year career he hit .266 with 1200 hits 240 doubles 30 triples 222 HRs 754 RBIs & a .360 on base %. In the outfield he played 1254 games with 68 assists a .989 fielding % making 27 errors. Family: Personally Bay is married with two daughters, and lives in the Seattle area during the off season. Since playing in New York he has bought a home in the Larchmont area of Westchester County. He is personal friend with Cleveland’s Grady Sizemore & the NHL’s Edmonton Oiler, Shawn Horcoff. His sister Lauren Bay Regula is a pro softball player and two time Canadian Olympic star. Bay became an official U.S Citizen in 2009 while playing with Boston.